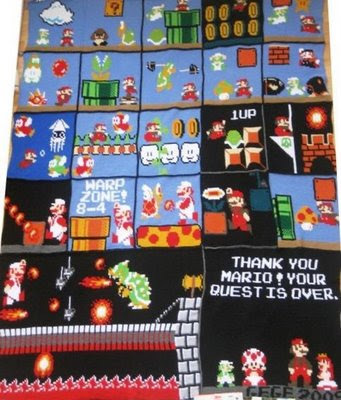 In light of Ben's and Sara's nursery plans, I recently came across two giant Mario blankets that were created using two very different crochet techniques. K's face immediately lit up and went into "puppy eyes mode," so I'm trying to decide which one is best (both style- and technique-wise). 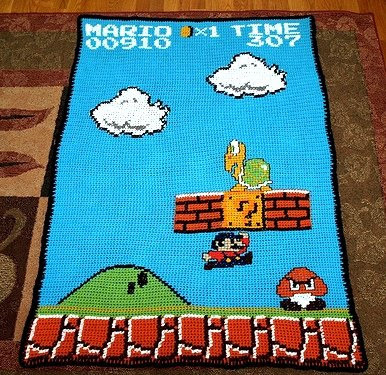 Technique: Made a solid background with single crochet (for the ground, sky, bricks) and then cross-stitched figures on top of the background. Technique: Each square was made with Tunisian single crochet and all color changes are made inline (not on top of the background). Gege has promised to put up a video that shows her color-changing process, but I'm a little leery, given my propensity for short-term projects that produce immediate results. Perhaps I could do a mix of both: use the cross-stitch method for making several mini-scenes. What do you think? I would buy one. you should make some and put them on ebay.